Opposing Candidates Favor Similar Economic Solution: Worker Retraining : It's All Politics Amid all the rancor, there is some common ground among Newt Gingrich, Mitt Romney and President Obama: worker retraining. It's an issue with broad political appeal, particularly in Florida where the job situation remains bleak. 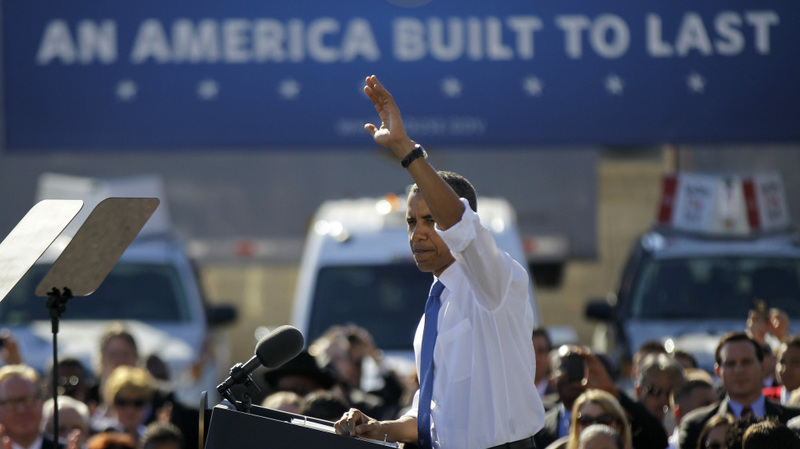 President Obama waves after speaking at a UPS facility in Las Vegas on Thursday. Nevada is one stop on the president's latest road trip focusing on the economy. There are not many things that President Obama, Newt Gingrich and Mitt Romney agree on, but when it comes to job training there is common ground. "It is time to turn our unemployment system into a re-employment system that puts people to work," Obama said during his State of the Union address Tuesday. Earlier in the week, Gingrich offered a similar solution for helping those facing long-term unemployment. "We should change unemployment compensation so if you need unemployment compensation, you also sign up for a training program run by a business," he said during an interview with WFLA radio in Tampa, Fla. Monday. Then on Wednesday, Romney also mentioned job training. "We've gotta have institutions that build human capital. ...That means great training programs for people who want to come back on the workforce," Romney said while in Orlando, Fla.
Of course, these men disagree on the details. The basic idea is you want to train people in occupations and industries where there are growing needs for workers and quickly get people out of industries that are shrinking. But at face value, they agree that worker re-education, in some form, is a useful solution to the country's unemployment problem. And economist Gary Burtless of the Brookings Institution says they're right, if the programs are designed well. "The basic idea is you want to train people in occupations and industries where there are growing needs for workers and quickly get people out of the industries that are shrinking," says Burtless. That may sound obvious, but there are many instances where job training programs prepare people for a field that's not hiring or provide general education that might look good on a resume but doesn't lead directly to a job. And even the best program requires highly motivated workers. Still, there are successful examples of job placement. Last year, the Aspen Institute in Washington ranked Valencia College in Orlando the top community college in the U.S.
"Every single intern I've ever supervised in 13 years of teaching here has been offered a full-time position at the end of the internship at the company where they interned," says Lisa Macon, who is chairwoman of the information technology program at Valencia. Some of her students learned computer programming decades ago and need to update their skills. Then there are people like Brian Peine. "Basically, two years ago I was with a large bank and with all the mess that happened in the financial industry everybody was downsizing. I got kinda caught up in that mess," explains Peine. He couldn't get rehired. Then one day, he was talking to an engineer at NASA. "He helped build ... my career path and said, 'Listen, if you do these things ... I can get you over as an internship at NASA,' " says Peine who followed that advice. "Ultimately, I want to be in robotics." That's the kind of story everyone applauds. During his State of the Union address, Obama said he wants to put more people on a path like Peine's. "Join me in a national commitment to train 2 million Americans with skills that will lead directly to a job," the president told Congress Tuesday night. The next morning, Romney pointed to a report by the Government Accountability Office, using it to suggest the country does not need more workforce training programs. "Do you know we have 47 different workforce training programs in Washington now? Forty-seven. Reporting to eight different agencies. All this money goes to the bureaucrats and the administrators and the overhead," said Romney at a rally in Orlando. He has proposed shrinking them down to just one program. Economist Burtless says there's surely room for improving efficiency. "But if you actually look at the numbers, how much does a country spend on this activity, the United States ranks near the bottom among rich countries," he says. "We don't spend a lot of money on this kind of activity." There's a separate problem, though. If worker retraining is to be the silver bullet to end the unemployment crisis, there would have to be the same number of American jobs now as there were five years ago, just in different fields. And of course, that's not how the economy works. "If we had a perfect training system and a perfect retraining system, we might be able to drop the unemployment rate currently by 2/10 or 3/10 of a percentage point," suggests Burtless. That's not much when unemployment is at 8.5 percent. In the long run, Burtless says, a good worker retraining program helps the general health of an economy. But in the short run, even if people of both parties can come together behind these proposals, a few tenths of a percentage point will not fix the job market.